I'm getting this post up now because I won't have a chance between now and leaving for a pretty sweet holiday. This is the last custom mat built before my trip to SoCal. She is for ASB by way of rent, what with us parking an RV on his driveway for almost a week. Given the fact that this is a gift, I've taken the liberty of naming her myself and so the Rincon Rental Raft has been born. "RRR" is a 200/70 free-breathing Ute with elastic rocker, a Hestered valve and a cracked patterned grip. I'm looking forward to seeing this gal get an outing in the flesh. So, last one until I get back. I'll be reading and replying to emails while I'm in the US and am hoping to get a few mat meets together. I have a brown baseball cap with an orange logo in my case and it will go free to the first person I meet over there who tells me face-to-face that they like brown, like orange and wear caps. Ladies and gents, boys and girls, this is the next instalment of weird surfmats for Andrew Stephen Buck, following hot on the heels of Pacmat. G-Mat 89 (AKA "Fluffy Sunshine") is a free breathing 200/70 Ute with rocker. You may also have noticed that she has a little artwork. Fluffy Sunshine is a gift for ASB from his good lady, Olivia. Apparently she was quite insistent about this theme. Thankfully, Andrew seems to like it. Whether or not the Rincon locals will get their heads around it is another question all together! In any case, we can be sure that there will be no missing ASB in the lineup and, should be lose his grip, Fluffy Sunshine should be easy to see. Ladies and Gentlemen! Boys and Girls! I give you, the G-Mat Rubber Bucky. ASB's Rubber Bucky Proto's: 200/70 top, 70/70 bottom. Apart from having possibly the funnest name to say out loud of all the G-Mat range (I bet you just tried it too) the Rubber Bucky is a contender for the Ute’s all-rounder crown. 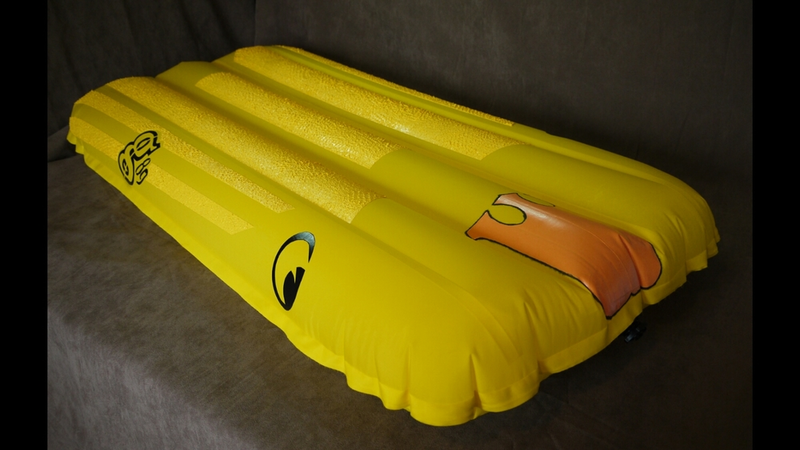 Developed in partnership with Santa Barbara mat-meister, Andrew Stephen Buck, this mat emphasises traditional high speed mat surfing, quickly finding a plane and favouring controlled drifts and subtle rail control, whilst still holding well enough on steep walls to get your fins out of the water and let loose. This three pontoon mat is slightly narrower than the Ute, but has a fuller feel due to having slightly more depth (thickness). The I-beam positioning draws heavily from the Ubercat giving a deep concave and pronounced rail hook. The overall feel is very different though with a greater width to length ratio and slightly enhanced bottom contours. Slightly rounder parabolic corners fore and aft work together with the bottom contours to give a clean progressive curve to aid hold. Well vented internal structures allow easy air transfer letting the mat to change shape rapidly, increasing speed and responsiveness. The Rubber Bucky works well with a 200/70 configuration (200 denier deck and 70 denier bottom skin) or 70/70 for increased sensitivity. Check it out in action from 1:10 in the following video.